I grew up eating this dish since I was born and raised in Louisiana. 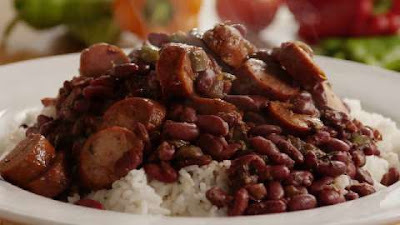 Typically you might hear of red beans and rice with Andouille sausage, which is traditionally eaten on Mondays using soaked red kidney beans, cooked with a ham hake, Creole seasonings, bay leafs, and sausage added in or topped servings over cooked rice. 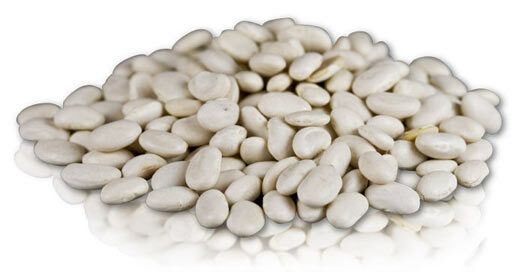 White beans are also called Great Northern Beans, not to be confused with Navy Beans, they are bigger but smaller than Cannellini beans or White Kidney Beans. 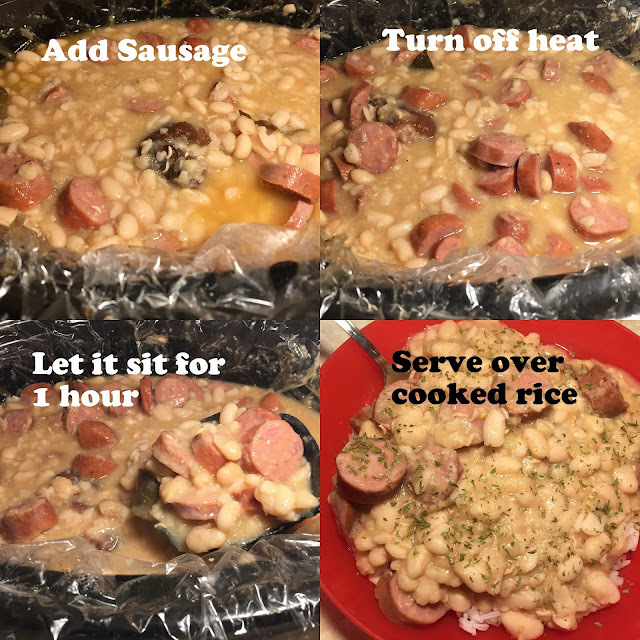 Together its a complete protein, relatively cheap maybe $10 for a whole pot of beans, rice and sausage and can be GLUTEN-FREE. Also can last for multiple meals. Please note I used a 7 quart Slow Cooker, so the cooking times might be different for each slow cooker. Go through the beans and take out any ones that look bad. 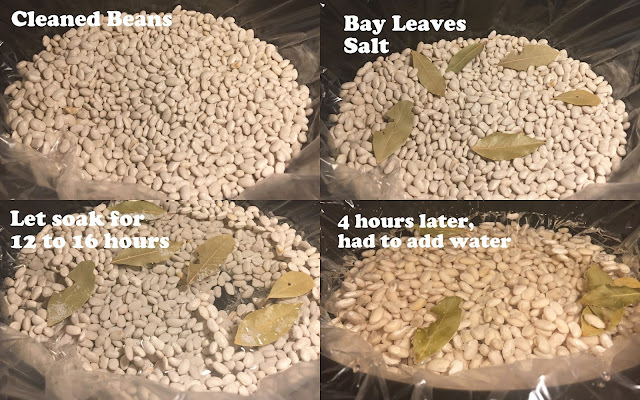 Line slower cooker with liners, add white beans, bay leaves and salt. Add enough water to cover the beans, about 3 to 4 cups. Cover and leave alone. You may need to add more water a couple of hours later. Let the beans sit for 12 to 16 hours without any heat. Add ham hock to the soaked white beans then sprinkle Creole Seasonings. You may need to add some additional water to the beans. Put the slow cooker on low and let it cook for 4 to 5 hours. Stir occasional. 1 hour before serving mash beans lightly then add Andouille sausage. Turn off the heat and let it sit covered, the broth will thicken. Cook rice while the beans are simmering. Serve beans over cooked rice, I cooked Jasmine Rice. Sprinkle a little parsley over the top. Let it cool slightly before consuming. Definitely looks good! I love the flavor the sausage adds to it! I don't think I've even tried a bean dish before. Might have to give this a try and surprise my family! Before I became a vegetarian I LOVED sausage. I may have to try this with veggie sausage. It looks so good! Yay another recipe! You're turning me into quite the adventurous cook! Wow this looks absolutely excellent! I really need to get myself a slow cooker pronto! Wow they look so good! I´ll definitely try them next weekend!! Oh this is so good looking, I just got my crock pot and I can finally make recipes like this. I have so many dried beans and didn't know what to do with them. 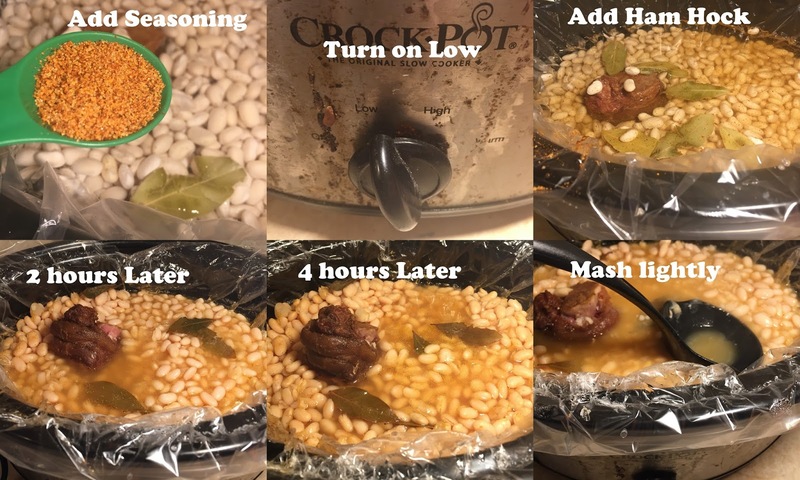 I love them just because they are cheaper, but when I bought them I learned, I don't know how to make them.lol Now I have a great slow cooker recipes to try out. Oooh this sounds like it will taste really good. Thank you for sharing! I need to get myself a slow cooker someday. I know what I'll be making this weekend! Can't wait! Looks like a perfect winter meal! This sounds like the perfect winter comfort food! And I love anything that's easy to throw together in the slow cooker. This looks and sounds wonderful! I am going to make this on Sunday after we return from Iceland. A perfect meal to warm us up! This looks delicious! I've never had this dish with white beans before. Ooh this looks just lovely, I would veto the sausage in favour for something veggie but it looks super healthy and im saving it to try! We love white beans - and I'm sure my hubby would love this version with the meat. I don't usually soak my beans, though. I just cook them a little longer and find they come out ok. I've never tried this before, but it looks awesome! My husband would love it because he's obsessed with any and every sausage recipe. This looks really good! I would probably take out the sausage for a more vegetarian-friendly option if I was to make it, but it definitely does look like a good option for dinner! Looks easy and delicious. I'm having some guests for later, I wouldn't mind treating them with this. Love it! This looks perfect to make with vegan soy sausage! I bet it would be great with quinoa, too! I love any recipe that I can just prep and throw in a slow cooker so this seems like a winner to me! Love slow cooker meals, so easy and no need lots of preps in the kitchen, and white bean is one of our favorite too!